customize QuickBooks for your business – just import a template from the CD and add your logo for customized reports and forms in an instant! understand basic accounting and financial reporting – reduce your dependence on your accountant by learning how use QuickBooks reporting. Put control of your business back into your hands! calculate accurate sales tax information – Sales Tax calculation and payment is de-mystified! This incredibly helpful manual is included with every purchase of our Quick Quote for QuickBooks software, however, the Survival Guide can also be purchased separately. *CD requires that your computer have QuickBooks by Intuit installed. On Sale $79 – Save $50! 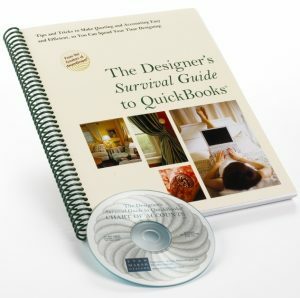 “The Designer’s Survival Guide to QuickBooks has been crucial in helping me learn to use my new accounting software. Everything is explained in a clear and logical manner.” – Kim DeStefano, Owner, All Sewn-Up, Berwyn, PA.